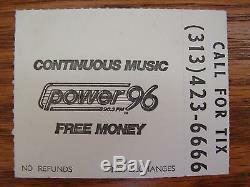 AUTHENTIC RARE VINTAGE PUBLIC ENEMY, ICE T, EAZY E NWA, EPMD CONCERT TICKET STUB. BRING THE NOISE TOUR FEATURING PUBLIC ENEMY & ICE T, EAZY E/NWA, EPMD AT JOE LOUIS ARENA, DETROIT, MICHIGAN, SAT DEC 10, 1988 7:30PM. TICKET STUB IS IN EXCELLENT CONDITION. THIS IS AN INCREDIBLE PIECE OF RAP, HIP HOP HISTORY/MEMORABILIA. 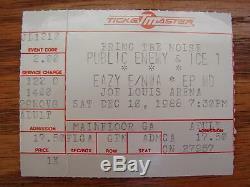 The item "AUTHENTIC RARE VINTAGE PUBLIC ENEMY ICE T EAZY E NWA EPMD CONCERT TICKET STUB" is in sale since Tuesday, March 01, 2016. This item is in the category "Entertainment Memorabilia\Music Memorabilia\Rap & Hip Hop\Concert Memorabilia". The seller is "thevintagedetroit" and is located in Flat Rock, Michigan.